Have you noticed your breath at all today? Have you consciously inhaled or exhaled even once today? This week is pretty hectic for me and so I am making an extra effort to pay attention to my breath even more as it gets lost in the chaos on the busiest of weeks. This week is a busy one, but the good kind of busy. Lots of projects I have poured blood (not really, but it sounds good), sweat and tears into are falling into place this week and it’s pretty neat to watch what I have helped create come to life. With that though comes a touch of extra anxiety, but if I give some extra love and attention to my breath, it keeps the anxiety from really taking over. Busy happens. But don’t let it get the best of you! Keep breathing, friends! 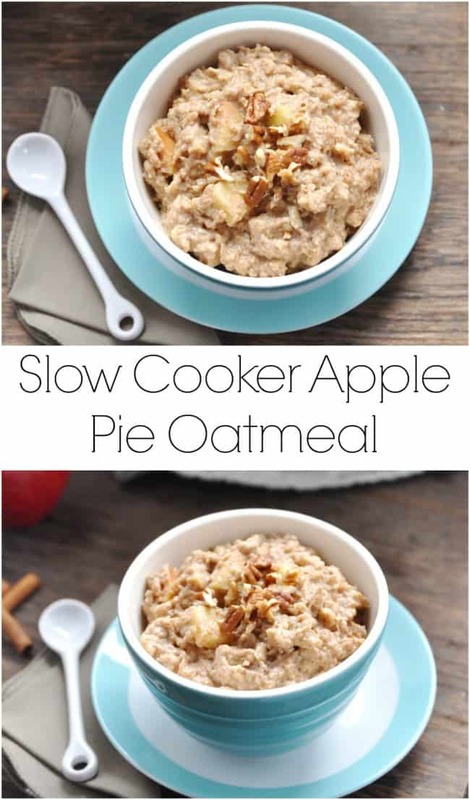 I learned a lesson with this Slow Cooker Apple Pie Oatmeal the first time around. I learned that it is not good to oversleep when you have breakfast waiting in the crockpot that has been cooking all night. The first go at this one turned into a blackened mush. No one wants to wake up to that! 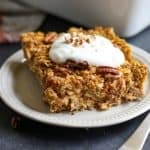 It was not even remotely salvageable, so I will save you the hassle and remind you NOT to oversleep when making this oatmeal! 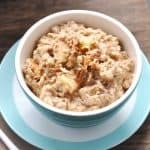 I love overnight oats and they are definitely so simple, but sometimes I want to wake up to a warm bowl of oatmeal. Don’t you? Well that’s what slow cookers were made for! Breakfast can be ready the moment you wake up, seriously. I would advise you the first time around to set your crock pot to the “Keep Warm” setting overnight as it was plenty for me. 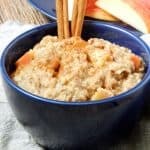 It depends on your slow cooker, but oatmeal doesn’t take more than 2-4 hours on low, so if you plan on getting your 8 hours in you best put it on the Keep Warm setting. 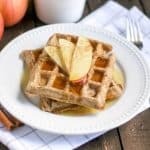 So get ready to wake up to the warm nostalgic smell of grandma’s apple pie, and bring calm to your morning routine! Core and chop apple into bite sized pieces. Combine all ingredients except the pecans/walnuts into slow cooker and stir to combine. Cover and set to "Keep Warm" setting. Allow to cook for 6-8 hours. Before serving, stir in chopped nuts of choice and serve with an optional drizzle or honey or maple. If your slow cooker doesn't have a "Keep Warm" setting, I suggest putting it to low and only cooking no more than 4 hours--maybe cook at night before bed and chill until breakfast.